Buchanan: Will Paris Riots Scuttle Climate Accord? 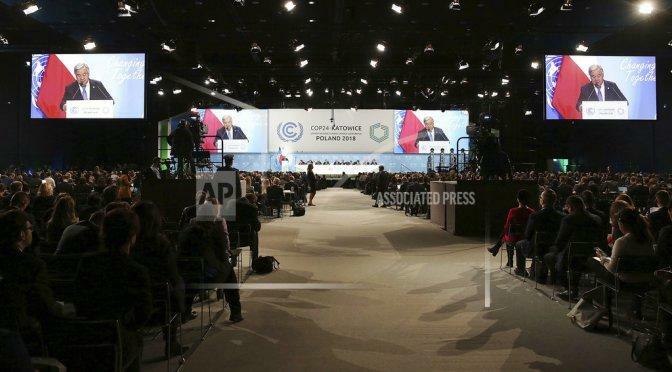 In Katowice, Poland, all the signers of the 2015 Paris climate accord are gathered to assess how the world’s nations are meeting their goals to cut carbon emissions. Certainly, the communications strategy in the run-up was impressive. In October came that apocalyptic U.N. report warning that the world is warming faster than we thought and the disasters coming sooner than we thought. What disasters? More and worse hurricanes, uncontrollable fires, floods, the erosion of coastlines, typhoons, drought, tsunamis, the sinking of islands into the sea. In November, a scientific report issued by 13 U.S. agencies warned that if greater measures are not taken to reduce global warming, the damage could knock 10 percent off the size of the U.S. economy by century’s end. At the G-20 meeting in Buenos Aires, 19 of the attending nations recommitted to the Paris accord. Only President Trump’s America did not. Yet, though confidence may abound in Katowice that the world will meet the goals set down in Paris in 2015, the global environmentalists seem to be losing momentum and losing ground. Consider what happened this weekend in France. Saturday, rage over a fuel tax President Emmanuel Macron has proposed to cut carbon emissions brought mobs into the heart of Paris, where they battled police, burned cars, looted, smashed show windows of elite stores such as Dior and Chanel, and desecrated the Arc de Triomphe. In solidarity with the Paris rioters, protests in other French cities erupted. Virulently anti-elite, the protesters say they cannot make ends meet with the present burdens on the working and middle class. We cannot see the benefits you are promising to future generations from cutting carbon emissions. And we cannot survive the taxes you are imposing on us in the here and now. What is happening in Paris carries a message for all Western countries. Democracies, which rely on the sustained support of electorates, have to impose rising costs on those electorates, if they are to deeply cut carbon emissions. But when the electorates cannot see the benefits of these painful price hikes, the greater the likelihood the people will rise up and repudiate those whom progressives regard as far-sighted leaders — such as Macron. Paris shows that Western elites may be reaching the limits of their political capacity to impose major sacrifices upon their constituents, who are turning to populists of the left and right to dethrone those elites. Trump has been using tariffs to cut the trade deficits America has been running in recent decades, to bring manufacturing back to the USA, and to restore America’s economic independence. Excellent goals all. But the immediate impact of those tariffs is rising prices at the mall and retaliatory tariffs on U.S. exports. Before the long-term benefits can be realized, the pain comes and the protests begin. No one wins a trade war, we are told. But an America willing to endure lost access to British imports in the 19th century emerged in the 20th as the greatest manufacturing power history had ever seen, a nation independent of all others, and able to stay out of the great wars of that century. Are the American people willing to make the sacrifices to restore that independence? Are the British people willing to pay the price that the restoration of their national independence, via Brexit, entails? Authoritarians have it easier. Morally revolting and socially ruinous as its hellish policy was, China was able to impose, for decades, a one-couple, one-child mandate on the most populous nation on earth. According to the Paris agreement, poorer nations were promised $100 billion a year, starting in 2020, to cut carbon emissions. Anyone think that the newly nationalistic peoples of the West will tolerate that kind of wealth transfer to the Third World indefinitely? In the Paris climate accord, China and India were given a pass to produce carbon emissions, while reductions were mandated for the Western powers. How long will the West go along with that, while paying ever-rising prices to cut their own carbon emissions? Japan, the world’s third-largest economy, is planning new coal-fired power plants and financing them across Asia. What we are witnessing is an irrepressible conflict between democratic governments committed to cutting carbon emissions “to save the planet,” and their constituents who can refuse to bear those sacrifices by throwing out politicians like Macron. Perhaps it says something about the future that the host city for this meeting of Paris climate accord signatories, Katowice, is in Silesia, a region that is home to some 90,000 coal workers — around half of all the coal workers in the EU.